OSU gets the top recruit of its 2019 class. 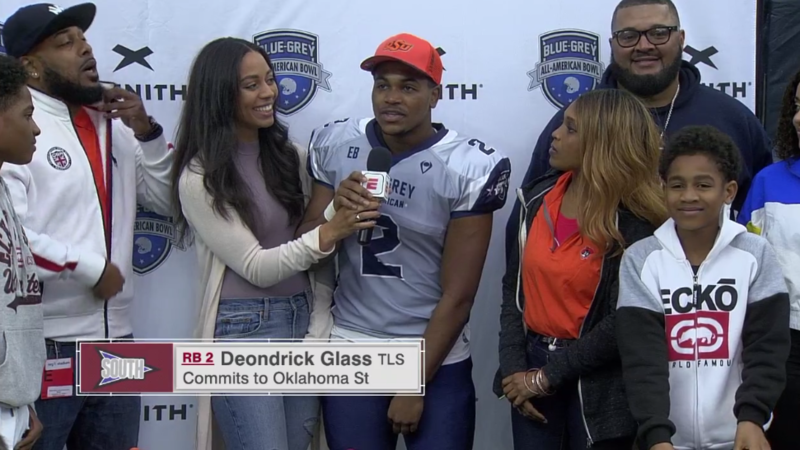 Four-star running back Deondrick Glass is headed to Oklahoma State. Glass made his decision public on Monday afternoon at halftime of the Blue Grey All-American Game on ESPN. He picked the Cowboys over offers from Alabama, Georgia, Miami, Texas, and a slew of other high-major programs. He was overcome by the moment as he paid tribute to his grandmother who passed away in February 2017. “She wasn’t able to make any of my games, but I know she’s in heaven now watching over me every step I take,” said Glass. Glass paused here as somebody in his group grabbed for the Alabama hat before juking and securing an orange and black one. “Go Pokes,” said Glass. And the decision was complete. Glass had been considered an OSU lean by many leading up to his decision, but it wasn’t a cut and dry decision for him. He had tabbed Alabama as his favorite last month, visited Miami, and heard pitches from programs across the country over the last month. But five-star Trey Sanders took what may have been the final RB slot for Alabama in 2019, and Miami landed a graduate transfer from Auburn, and Texas already had a four-star running back, and, well, you get the picture. OSU was the lone program standing in the end, and benefited the most by its patient and persistent pitch with him. Glass instantly becomes the highest-ranked commitment for OSU in the 2019 recruiting class and if all holds true until signing day, the fifth-highest ranked running back to ever commit to OSU, behind only Herschel Sims, Tatum Bell, Tyreek Hill and Devon Thomas. As a senior last season at Katy High School, Glass ran for 1,924 yards rushing on 225 attempts and found paydirt 30 (!) times, tied for a season-high with his 30 touchdown sophomore season. In his illustrious four-year high school career, he rushed for 6,154 yards rushing on 673 attempts (9.1 yards per carry) and scored 100 touchdowns.